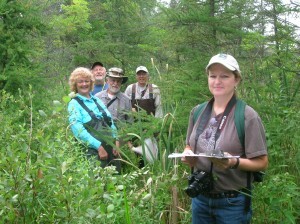 Sara Thomas, Executive Director of the Livingston Land Conservancy, and LLC members enjoying a field assessent in a fen. After a record-breaking March and a more typically cool April, we don’t know what we’ll find out in the field this spring! I’ve seen trilliums blooming (usually they come out in late May) just uphill of freshly sprouting skunk cabbage (usually a harbinger of early spring in early April). I can’t wait to get our annual Bioreserve Field Assessment season started! Join us in surveying the woods and wetlands in the Huron watershed! WHAT: Volunteers go out in groups to work together on rapid site assessments of grasslands, forests, wetlands, and aquatic habitats throughout the spring, summer and fall (an expected time commitment of four hours per site). Volunteers must first attend a training where you learn how you can help identify high-quality natural areas for protection as part of the Bioreserve Project. Participants will gain broadly applicable skills in ecological assessment. Please bring a sack lunch. The workshop includes hands-on practice outdoors, so please come prepared for weather and mud. WHO: All volunteers are welcome, but if you are experienced in plant identification, we especially need your help! Every team will need at least one “plant person” (someone who has some experience with identifying plants). If you have had a plant identification class, or have become familiar with wildflowers, grasses, and trees over time spent hiking this beautiful watershed, we’d love your help! “Plant People” do not need to attend the training; all other volunteers do. WHERE: The next training will be at Independence Lake County Park. After attending training, volunteers use the Volunteer Page to sign up to go to natural areas throughout the Huron Watershed throughout the field season. 2012 Field season: May – October 2012. MORE INFO: Contact Kris at kolsson@hrwc.org or 734-769-5123 x 607.